U21 Championship. 7th round. September 9, 2016. Shchaslyve. Kniazha Arena. 24 degrees. 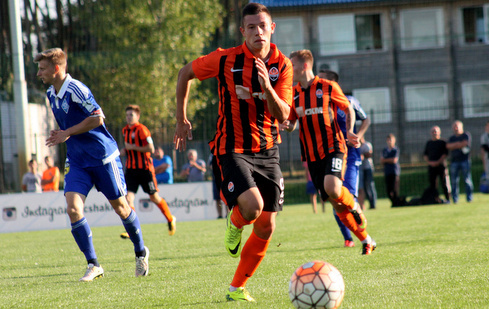 After six rounds Shakhtar and Dynamo had 16 points each and were in the top of the standings. The Pitmen were forced to do without the top scorer of the current season Mykyta Adamenko, who had missed the training due to illness - Denys Arendaruk was included in the starting line-up. In the absence of Mykola Matvienko, his place on the left flank of the defence was taken by Oleksandr Mihunov, and Taras Kacharaba and Danylo Sahutkin played the backs. The game started right off. In the initial minutes of the match, Oleh Kudrik took care of the long-range shots by Mykyta Kravchenko Artem Besedin. The first real chance for a goal occurred in the 11th minute for Shakhtar: Oleksandr Zubkov won the tackle with Ochigava, turned and shot into the near corner - Makhankov deflected the ball to a corner with his foot. However, very soon, the Orange-and-Blacks took the lead: the same Zubkov moved to a free zone in the penalty box and completed Kiryukhantsev's pass with one shot - 1-0. The Kyiv team moved out in force and on 35 minutes restored parity: Mihunov was passing the ball to Kudrik with a header after a flank volley, Orekhovskyi went for the ball and prevented the Pitmen's goalkeeper while Besedin scored low. After the half-time break, Shakhtar managed to score an early second goal. On 51 minutes, Zubkov took away the ball in the opponent's half of the field and sent Andrii Boriachuk into the penalty area, where the latter beat Lukianchuk and mage a great shot into the far corner - 2-1. In the middle of the half Makhankov was not at his best when assisting the sweeper, and Boriachuk could have made a brace, but his shot from outside the box was wide. Dynamo equalized on 72 minutes - after a set play by Kravchenko Ochigava sent the ball into the net. And later Shepelev took advantage of the mistake by the Pitmen's defence - 2-3. 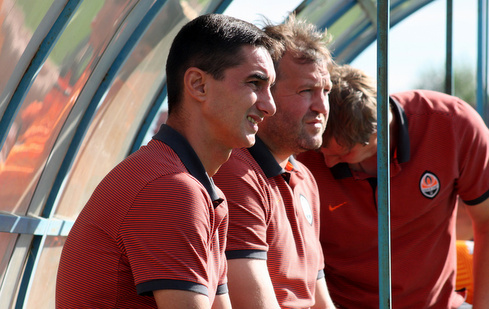 Valeriy Kryventsov's squad were looking for ways to approach the opponent's goal, but the score remained unchanged. In the 8th round the Orange-and-Blacks will meet Vorskla Poltava on September 17. - Taking into account the principle of the confrontation, both we and the Kyiv team really wanted to win today. This desire was evident from the start and throughout the match. Our performance in the first half was very interesting. The team used a lot of combinations, acted diversely. The first goal was scored after a practised combination: Kiryukhantsev moved along the flank, passed to Zubkov who scored in one-touch. Then there was an individual mistake of our defender, and the Kyiv team equalized out of nothing. In the second half we continued to play good football, once again deservedly taking the lead after good individual actions by Andrii Boriachuk. Without slowingdown, we tried to extend the lead, and there were prerequisites for that. When the score was 2-1 Boriachuk came one-on-one with the goalkeeper, beat him, and the keeper brought down our player with his hands. It was an evident penalty, after which the score would have been 3-1, and there would be no questions as to the winner. But the referee, for whatever reasons, did not record a foul. After this we gave the opponents an unnecessary free kick in centre-field and a Dynamo player made an incredible header. At this moment the match psychology changed a little. The Kyiv team wee probably satisfied with a draw, but we weren't. We wanted to score a third goal and went forward, however, in a simple situation our defenders made another mistake, not managing to kick the ball out of the penalty box. As a result, we lost the match, which we should have confidently won. It is very sad, since we have managed everything except the final result. I always told the guys, working with them in the U16 and U19 teams, that there are no little things in football. One episode on the field affects everything: a team leaving the Champions League, the lack of gold medals ... One little episode decides everything. Perhaps they have forgotten it, because two such blunders at this level are unforgivable. And today we lost because of individual mistakes. After the match I told the players that we need to move over this loss and continue to work, since they have a big goal - to move up into Shakhtar's first team. And if they want to achieve it, we will do everything to help them, but they will need to try harder on the field and work twice more.